Wow, it’s been way too long since I’ve updated the blog! A lot is going on these days. We’re STILL in Philadelphia but making many, many preparations for Korea. Since the swirl molester guy got caught, the Koreans are going nuts about about security, and rightly so. It’s probably something they should have done a long time ago, but it is making it more of a pain for us. So from what I can gather, you now need a full medical exam and a criminal background check in addition to all the other required documents. “Hello, can I make some kind of appointment to get some medical work done there or can you refer me to someplace else?” She says “What do you need done? Are you a patient of a doctor here?” I say “Well, I just moved here from California and don’t have a doctor, and I don’t have insurance either. I just need some basic blood work done and a chest x-ray to fulfill a requirement for this job I’m getting overseas.” She says, “If you don’t have insurance I don’t think anyone will help you here. And we don’t do any blood work here at the hospital. We wouldn’t be able to do a chest x-ray either.” I say “Well, can you refer me to someplace else that could do those things?” She says “Humm, you know, it’s really hard, I can’t think of anywhere that would be able to do those things.” I sit on the phone stunned. You can’t get blood work or x-rays done at a hospital? And she doesn’t know of anywhere else that can do it. Humm… What’s wrong with this picture??? Is it me or what? So I call the Korean consulate in New York. Me, “Hello, I’m calling about the EPIK program.” Him, “Well, you missed the deadline, today is the cut-off for applications.” Me, “Oh, so I guess I’m too late, Thanks anyway.” Him, “Well, no, don’t get that impression. You can still apply anytime and it won’t be a problem.” Me, “Oh, I see.” Well, I think I see anyway… Me, “So I have to get this new background check, but the problem is I lived in California for four years and in February I moved to Georgia, but I’ve been staying at my in-laws house in Philadelphia for six months or more. Which state should I get the background check from.” Him, “Umm.. Well… Ahhh…” A few more moments of stunned silence. Him, “Just get it for your current location.” Me, “Even though I don’t really live here?” Him, “Well, umm, get it for California then. Yes, I think it would be fine from California.” Me, “Oh, ok.” Well, I’m glad I called and got the definitive answer from the EPIK department. With that “so so” answer we decide to email EPIK directly on the website to get to the bottom of the matter. We send a four paragraph email explaining the situation and get back a one line response “Just get it from you current location. That will be fine.” I have the feeling that I could get my uncle who is a police officer to write me up a page or two on letter head and they would say “Great!”, as long as it didn’t say anything bad, of course. I really don’t think they would check sources. It seems like the documents are just to console their minds. I’m sure this is what traveling and cross cultural relations are all about though. It does make me cranky sometimes. But I’m trying to keep reminding myself to take it all in good fun. And for the most part, it is. Oh, we went to Pittsburgh for thanksgiving at my parent’s house. My brother and his family drove up from Annapolis as well. So everyone was together for the first time in a long while. It was nice. It was a treat to spend time with my brothers two girls, Olivia and Tess. They are both growing up way too fast! I wish I couple summon that much energy as easily as they do each day! Ok, back to work. I hope everyone is well out in la-la-land! In the Applications > Utilities folder open the Audio MIDI setup. Find the audio output settings and change it from 96khz to 44khz or 48khz. Viola!!! This fixes the problem. Yay! Today Nancy and I ventured down to the city on the train. It took about 45 minutes, not too bad. But it did cost $24!!! I think that’s pretty darn expensive. Too bad everyone wants their own car, it makes it hard for the rail systems to survive I guess. 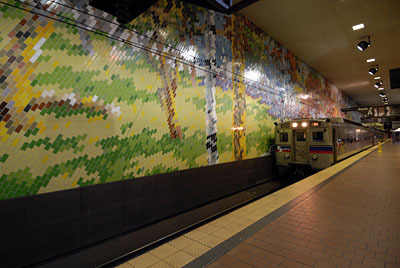 The picture above was taken at Market East Station when we got off the train. The train in the picture was the train we rode in. The station is underground and you come out right in the Terminal Market. The place has many restaurants and other shops. We walked a few blocks from there to go and check out a local Gelato shop. I took some pictures of the place for my friend Michael who just opened up a shop out in Marin, California. 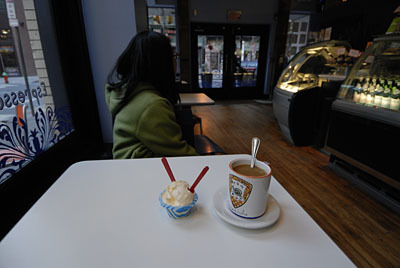 I snapped a quick shot of my coffee and tangerine gelato. The place only had a few people when we came in, but a few minutes after this shot it filled up almost to capacity. Nancy was surprised that so many people would want a cold desert on such a winter day. We stayed for a while and I did some research on Korea jobs and then we headed home. It was fun to get out and about for a bit and do some people watching. Nancy found this stop motion animation clip while surfing around on the net. He did it all on a white board I think. Pretty cool video, check it out!